BlackBerry Bridge not supported by AT&T | BlackBerry Blast! It's BlackBerry PlayBook launch day and a lot of PlayBook users will want to download the BlackBerry Bridge. AT&T users will soon discover that AT&T is blocking the software in the market. 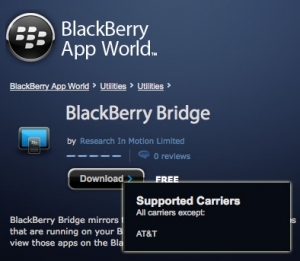 If you try to download BlackBerry Bridge you will receive a message that the software "not supported on your device or carrrier." It appears that AT&T maybe worried about free tethering with BB Bridge. A CrackBerry user has posted a workaround by placing the BlackBerry Bridge in a Dropbox account. Once you get the software, it does work on AT&T. The only problem is, are you willing to download this software from some anonymous Dropbox account? Let's hope AT&T gets a change of heart and stops blocking the BlackBerry Bridge software.